With the Atlantic Ocean at the front, Great Pond behind and Martha’s Vineyard on the horizon, this resort is surrounded by Cape Cod’s natural beauty and rich nautical history. Accommodations include studios, 1 and 2 bedroom suites with fully equipped efficiency kitchens and private decks with great views. Sandwiched between Vineyard Sound and Great Pond, the RCI Silver Crown-rated Surfside offers some of the best waterfront views in Falmouth. 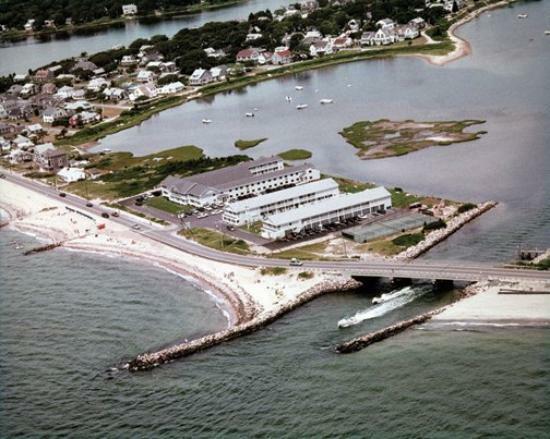 With its own private beach directly across the street, guests will enjoy the warm waters of Cape Cod. Main Street Falmouth is a short drive away and boasts many great restaurants and shopping. The ferry to Martha’s Vineyard is also close by. Spend your morning out on the private patio or balcony, or soak in some sun on the outdoor pool deck. Surfside is close to everything — beaches, golf and shopping, but far enough from the hustle and bustle of Yarmouth for peace and relaxation when you want it. You are sure to be enticed into exploring the ocean beaches and the Cape’s history. Studio villas provide a partial kitchen (has cooktop, but no oven or dishwasher), queen bed, queen sofa sleeper bed, and boast an ocean view from the deck/balcony. Rack rate $1561 plus tax and cleaning. One bedroom condos have a separate bedroom with whirlpool tub and king bed. You’ll find two full bathrooms, a complete kitchen with stovetop and oven, and ocean or bay views from the balcony. Unit sleeps four. Rack rate $2044 plus tax and cleaning. Rack rates from 8664myvacation.com reservations. Our prices are much lower!